The magician shows an plastic empty frame to the audience. And then he appears two dove cages from it. 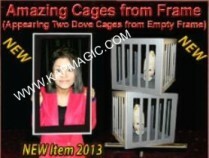 This item is including a frame and 2 PCS dove cages. The cages are wooden cube and their size is 20.6 x 20.6 x 20 cm.